The World Baseball Classic is in full swing, with first-round play going on as I write this. If you have been following some games with MLB Gameday, you already know that in major league stadiums PITCHf/x cameras have been tracking the data. Sadly, in the first round that is only the games in Toronto but after this round every single pitch should be tracked. So right now we just have a small taste of what is to come and we finally have some new data to sink our teeth into. Many MLB veterans like Jake Peavy, Roy Oswalt, Felix Hernandez and Jason Grilli have been plying their trade and later we will examine how they are faring in comparison to their 2008 numbers, but for now I would like to focus on a few lesser-known players who may pitch in an MLB stadium near you. Yoel Hernandez was in the Phillies organization and had a cup of coffee in 2007. Despite decent numbers in the minors, Hernandez was released by the Phillies and pitched last year in Mexico. After he pitched well there, the Phillies re-signed Hernandez this offseason. Hernandez is a classic sinker/slider guy and you can see that from his movement chart. There are plenty of sinker/slider right-handed relievers in the big leagues, but Hernandez stacks up well against league average. He throws his sinker around 91 mph, which is fast for that pitch and helps make up for his nearly five inches of vertical rise. His sinker is closer to Chien-Ming Wang than Derek Lowe. Hernandez’ money pitch, however, is his slider. He gets good horizontal slide with it and little vertical rise means he can keep it down in the zone. Baseball America had it as the best slider in the Phillies organization in 2005. Hernandez almost certainly throws a change-up to go with his sinker and slider, but he didn’t face a left-handed batter, so he hasn’t thrown a change-up yet. Hernandez will be 29 when the season starts, so he is in the prime of his career and he does have a big league arm. He doesn’t have the stuff to be a star, but he does a decent job of keeping the ball on the ground and his quality slider means he should strike out more batters than most sinker/slider guys. He could be the 11th or 12th pitcher on a staff and likely will see some time in the big leagues this year. Mark DiFelice has had a long career in the minors after being drafted by the Rockies in 1998. At 31 last year, DiFelice pitched very well for the Nashville Sounds in Triple-A and earned a call-up with the Brewers for the first time in his career. DiFelice pitched extremely well in the WBC for Italy over the weekend, holding a pretty good Venezuelan team scoreless for four innings, allowing only three hits and no walks. The way DiFelice did this is the remarkable thing. Here is a look at his movement chart. Yes, that is right: DiFelice threw only four fastballs and two curveballs in his 45 pitches. The rest were sliders. The commentators called this a cutter and DiFelice calls it a cutter, but the pitch moves like a slider so I am calling it that. It is five mph slower than his 87 mph fastball and has much less vertical rise. It he wasn’t throwing it so often there would be no doubt that it would be called a slider. Anyway, this is nothing new for DiFelice, who threw exactly the same way when called up last year. I have questioned whether DiFelice can get by throwing slider after slider, but the evidence is starting to mount. He pitched very well in the minors the last two years, he pitched well when called up by the Brewers last year, and now he has pitched well in the WBC. At some point you have to stop questioning and just go with it, and we are nearing that point with DiFelice (if we aren’t already there). DiFelice is even tipping his pitches worse than than almost any other pitcher I have seen. Check out his release point. One other thing to note: Vinny Rottino, who caught DiFelice in Triple-A the last two years, caught him again in the WBC. Being on the same page with the catcher certainly could have helped DiFelice. Whether he makes the Brewers roster out of spring training or not, expect to see him pitch in the majors this year and expect to be flooded with change-ups. While the Italian team is mostly composed of American-born players of Italian descent, Alessandro (Alex) Maestri was born and raised in Italy and has now become the first such player to make it to Double-A. Despite being just 23 last year, Maestri has been pitching for the Italian National team since 2006. The Cubs signed Maestri that year and he has been pitching pretty well in the minors since. Here is a look at his movement chart. Maestri’s best pitch is his fastball, which he throws around 93 mph with solid movement. The confusing stuff is his off-speed pitches. My algorithm is calling the five pitches to the right curveballs and the one pitch in the middle a slider, despite the slider having more vertical movement down than the curve. The reason for this is the curves came in around 77 mph and the slider was thrown at 83 mph. We need more statistics on Maestri to straighten this out, but whatever you want to call his main off-speed pitch, it is slow and slurvy. Maestri likes to begin the at-bat with that pitch, throwing it three times in just seven batters. Hei is still quite young and has a lot to work on, especially his off-speed pitches, but he has the talent to be a solid bullpen arm in the future. After pitching several years in the minors, Cody Cillo moved to Italy in 2006 and has been pitching in the Italian leagues ever since. 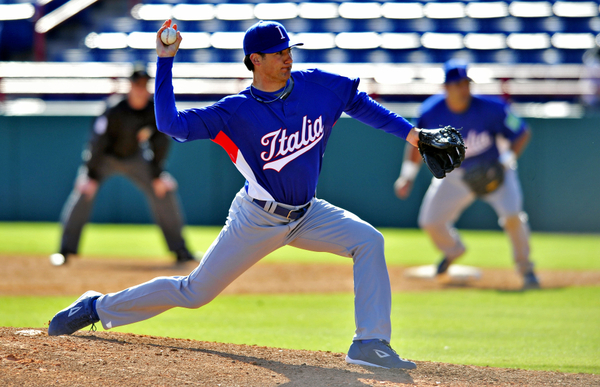 Cillo’s claim to fame was as the winning pitcher in Team Italy’s win over Team USA in the 2007 Baseball World Cup. In 2008, he won pitcher of the year in the Italian league with an ERA close to one. Cillo gave up a home run to Melvin Mora in his short outing over the weekend. Cillo is another sinker/slider pitcher with very good vertical drop on his sinker. Unfortunately, he throws it only around 87 mph or it could be a major league pitch. It also has a lot of horizontal movement in to a right-handed hitter, so he is likely a lot more effective against them. Cillo’s slider is also a decent pitch with good movement both horizontally and vertically. The pitch that is really interesting to look at, though, is his change-up, which has less horizontal movement than his sinker. While some other sinkerballers have similarly moving change-ups, Cillo is taking this to the extreme and it likely isn’t in the same plane as his sinker. This may not be a problem against Italian hitters, but something major league hitters would be able to see. Cillo doesn’t have the stuff to pitch in the big leagues, but he probably could do quite well in Double-A. That gives us a barometer on how good the Italian league is, considering how dominant he has been there the past few years. Over the next few weeks, I plan to look at more pitchers who aren’t on too many people’s radar. With Japan and Korea already qualifying, that means a potential sneak peek at the next Daisuke Matsuzaka. Also, after the next round, we should have enough data to compare pitchers from 2008 to their WBC numbers—what he’s throwing in March compared to what he threw in June.